You are here: Home / Blog / Volunteer of the Year! 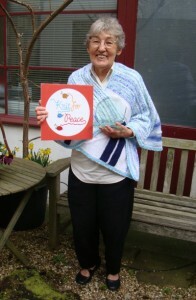 We are thrilled to congratulate Marilyn for winning Office Volunteer of the Year in the Charity Staff & Volunteers awards, 2015, for all her help at Knit for Peace HQ. Thoroughly deserved! A big thank you to Marilyn for all her hard work, as ever. We especially needed her help sorting and packing this week after receiving a huge delivery of over 3,000 items! 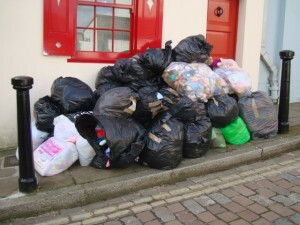 We’ve all been really busy sorting that delivery, whilst keeping up to date with all your other donations flowing in. It’s great to see more adult items and larger blankets – thank you for responding to our requests and keep up the great work! As fast as your donations come in, so we send them out. This big influx has meant loads going out too; we’ve passed your woolies on to women’s refuges, homeless shelters, hospitals, and sent a large consignment to be given to orphanages in Tanzania. In other Knit for Peace news, Jane Crowfoot has been sewing large blankets together for us in the office today so they can be sent to those in need. A big thanks to Jane for her help, and for agreeing to lead our next Knit for Peace holiday at the Green Hotel, Mysore! Dates are yet to be confirmed, but it will be January/Febuary 2016. You can read about our most recent holiday here. A massive thanks to all of you for your beautiful knits – we couldn’t do our work without your support.